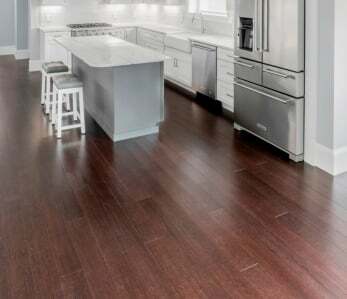 Home › Flooring › Is Bamboo Flooring Installed Under Kitchen Cabinets and Islands? 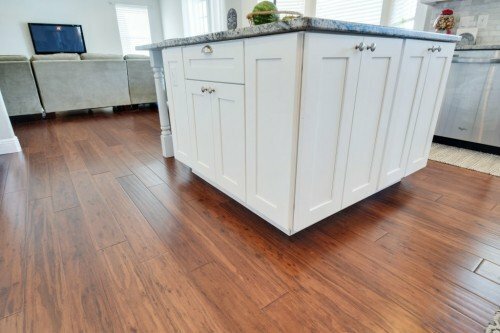 Is Bamboo Flooring Installed Under Kitchen Cabinets and Islands? Bamboo floors are beautiful and strong. Installing them in a kitchen renovation is a trend that’s not going away any time soon, due to the durability of strand woven bamboo. Still, people wonder about the practicality of putting bamboo in the kitchen. The most common concern is about water. In a post about the , we explored that concern. We showed that, yes, works great in kitchens, as strand woven bamboo flooring provides 20 hour spill protection and small water droplets just evaporate. 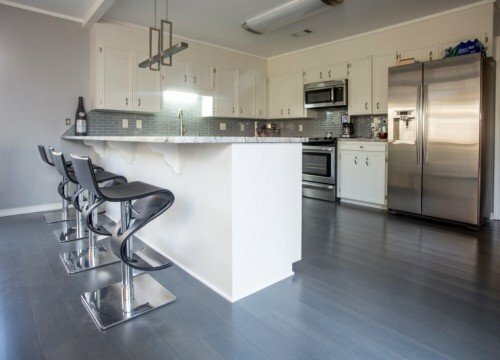 Can I Install Bamboo Flooring Under My Kitchen Cabinets and Island? The short answer is YES for a nailed down or glued down floor, and NO for a floating floor. Bamboo is durable, easy to clean, water-resistant, and complements a wide range of decor styles. So, the real question is about installation. Here’s the straight goods on installing bamboo kitchen floors. The subfloor is most often a structural layer of plywood, but it can also be concrete or other materials. It covers the floor joists and forms the foundation for the other layers. The underlayment sits atop the subfloor, and under the bamboo floor. For nail down installations the typical underlayment to be used is 15 lb asphalt saturated felt paper or red rosin paper. They help reduce wood on wood squeaking. For floating installations you’ll want to use a , which is used to help muffle sound, protect against moisture, and improve comfort. 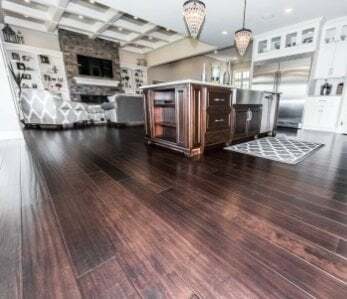 In the majority of nail down and glue down installations, professional flooring installers advise putting down the whole floor before adding islands and cabinets. Those are compelling reasons for installing the floor first. But we said professionals only recommend this in most cases. What’s the exception? Floating floors. Sometimes called “click-lock” floors, floating floors aren’t nailed or otherwise secured to the subfloor. As a result, natural expansion and contraction of the bamboo will cause the floor to move. The movement isn’t significant enough for you to notice through daily use. But if anything heavy and immobile — like islands and cabinets — is on top of it, its range of movement is restricted, which can cause the planks to separate from each other over time. To avoid that unwelcome outcome, be sure to install lower cabinetry, islands and other permanent fixtures BEFORE laying the floating floor. Proper installation of floating floors involves leaving expansion gaps where the floor meets permanent structures, including walls. Remember, before installing your bamboo flooring make sure to acclimate it first for at least 72 hours in the room in which it’s going to be installed. Also, floating wood floors require stable interior humidity – which means you’ll want to maintain stable humidity that doesn’t fluctuate more than 20% throughout the year (you can open your windows for the day, not a problem). To compensate for any normal climate variations (e.g. rainy seasons, snowy winters, or waterfront locales), be sure to have internal climate control to manage humidity levels. The amount of typical fluctuation of interior humidity will also dictate how long runs should be across the widths and down the lengths of planks. Download our for more detail. 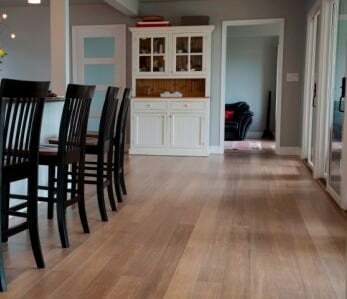 There’s a lot more to using bamboo floors in the kitchen beyond how they affect the installation of islands and cabinets. To increase enjoyment of bamboo floors in the kitchen and reduce maintenance, many people place a slip-proof mat at the sink. Using fun and stylish mats under pet dishes can also minimize the need for quick clean ups. Bamboo floors stay warmer underfoot compared to tile. Bamboo is durable against the frequent and heavy foot traffic common to kitchens. You’re freed from cleaning grout, which is a necessity with the tiled kitchen floors. 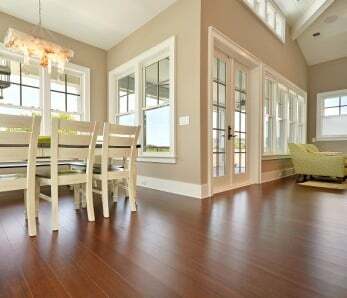 Bamboo floors are an eco-friendly choice because of bamboo’s natural rapid growth to maturity. Bamboo can be refinished multiple times, although in a residential setting strand woven bamboo will likely never need to be refinished. This makes it an excellent long-term investment in your home. So, are you ready to have a bamboo floor in your kitchen? The biggest limitation to using bamboo floors in the kitchen is your imagination. But with so many examples of beautiful kitchens with islands, you’ll be inspired in no time! And, when you’re ready, we are too. Not only do we have hundreds of flooring options. We do our best to stock moldings and trim pieces plus common installation supplies at competitive prices. That means you or your installer don’t spend time searching for materials. When you’re an Ambient customer, you floor, moldings, and installation supplies arrive in one shipment. You can get your project underway without delay. Plus, our team of floor experts are only a phone call or email away if you have questions or concerns. 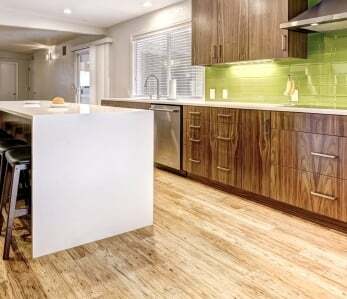 Is a bamboo kitchen floor in your future? We’ve served more than 10,000 satisfied customers and are ready to serve you too. today to get started.